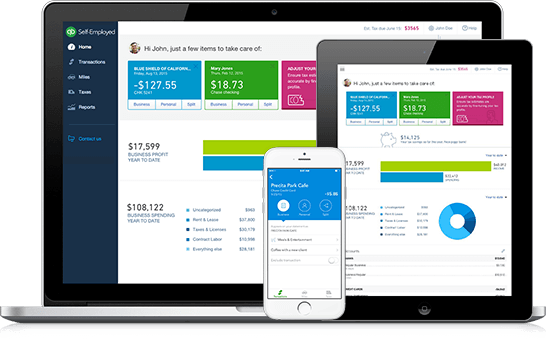 Independent contractors and freelancers save more using QuickBooks Self-Employed. Upgrade to the bundle and we’ll export your Schedule C to TurboTax so you can pay your taxes online with the #1 tax prep software. **50% off the monthly price for QuickBooks Self-Employed and 29% off the monthly price for the QuickBooks Self-Employed Tax Bundle is for the first six (6) months of service starting from date of enrollment, followed by the then-current fee for the service. Your account will automatically be charged on a monthly basis until you cancel. Offer not applicable with free trial. You must select the Buy Now option. Offer valid for new QuickBooks Self-Employed customers only. Promotional period starts May 2, 2016 and is available for a limited time only. No limit on the number of subscriptions ordered. QuickBooks Online Payroll is not available with QuickBooks Self-Employed. QuickBooks Self-Employed uses technical and administrative security measures such as, but not limited to, firewalls, encryption techniques, and authentication procedures, among others, to work to maintain the security of your online session and information.